Franco-Prussian War (1870-1871) - Otto the Great's dream of unifying the German people into a single nation was finally realized in 1871. Ironically, it was another Otto (this time von Bismarck) who was the primary driver of unification. As a Prussian nationalist who rose to power in the 1860s, he devoted his efforts to creating a single German state. And he realized that accomplishing it would require an event that raised patriotic ferver across all the independent states; an event such as...a war. His target for achieving this goal was France. Although Austria had been Prussia's long-standing rival, the two countries shared a common ancestry and many of the smaller German states would never rally to Prussia's side. France was the natural choice from Bismarck's perspective. He considered France to be a destablizing force in Europe (based on Napoleon Bonaparte's conquests earlier in the century) and the two states were involved in a territorial dispute at the time. But a war with France alone would not be sufficient. France would also have to be the aggressor. In 1868, an opportunity presented itself, strangely enough, in Spain. Queen Isabella II was deposed and the monarchy was offered to Prince Leopold of Swabia. Leopold happened to be the nephew of King Wilhelm I of Prussia, and Bismarck (Minister President at the time) very much favored the offer. But in France, Emperor Napoleon III strongly opposed it. A Prussian-Spanish alliance would be a major threat to France. Leopold declined the offer after the French vigorously protested, but Bismarck found a way to exploit the situation. The French ambassador to Prussia met personally with King Wilhelm and wanted his assurance that no German prince would accept an offer to become ruler of Spain. King Wilhelm refused to agree to the ambassador's request, but the meeting ended cordially. The king's secretary recorded the events of the meeting and passed them on to Bismarck. Bismarck deleted certain portions of the account (he did not add anything to it) so as to make it appear as though the ambassador had made a demand of the king, and the king responded by insulting France's ambassador. He then released the edited version in the form of a telegram, which became known as the Ems Dispatch. It had the exact effect Bismarck had hoped for. The French took the statement as a provocation and after some debate, France declared war on Prussia in July, 1870. The declaration also had the effect Bismarck intended. The smaller German states immediately aligned with Prussia against France. The war itself was a relatively one-sided affair. Prussia and her allies had a much larger army and severely out-gunned France. The whole conflict lasted less than a year (only 10 months). 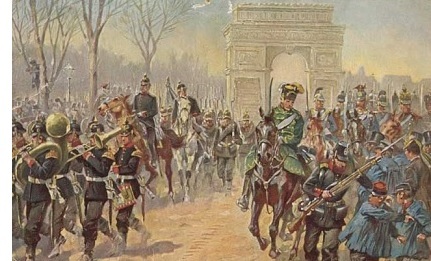 It began with the Siege of Metz by the Prussians; and when the French tried to lift the siege, the Prussian army decisively defeated them at the Battle of Sedan. From there it was an easy march to Paris and the city fell in January 1871. France surrendered and the war ended with the signing of the Treaty of Frankfurt, which formally recognized Germany as a sovereign nation. However, it was a stinging defeat for France, particularly because it had to cede Alsace-Lorraine to Germany. The loss would sow the seeds of resentment that would simmer all the way up until World War I four decades later.